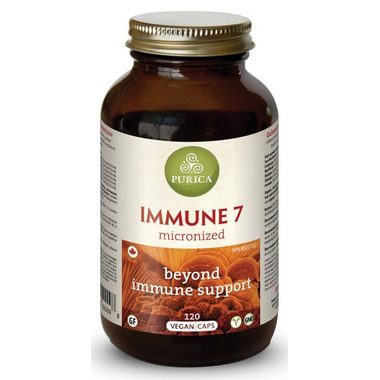 Purica Immune 7 provides superior support for the immune system. It may be used proactively, or to assist a suppressed immune response. Containing beta glucans and other mushroom compounds known to be highly effective in activating immunity, Immune 7’s high bio-availability makes it the gold standard of mushroom therapy. Purica Immune 7 is one of the most comprehensive immunomodulating formulas available today. The strictly controlled organic methods of mushroom cultivation ensure that our products are of the highest possible quality. The end result requires no irradiation, is always GMO-free, and far exceeds the original potency. Directions: Take 1-3 capsules per day for immune use or as directed by a health care practitioner. Take with food.